What’s the best way to prepare yourself for an indulgent Valentine’s Day dinner? Why, with a pampering couples massage treatment, of course! 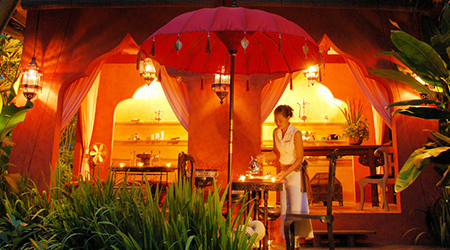 Sign up for three hours of Ultimate Couple Bliss in your very own Thai sala. The man will enjoy a four hands massage, while the lady will be given a therapeutic hot stone massage. Let the therapist work away the stress and knots in your body, before going for a rejuvenating anti-aging facial so you can put your best face forward for dinner. There’s plenty of delicious treatments at Away Spa – like the Coconut About You scrub or the luxurious sounding Well Fantastic Island (which includes a herbal steam bath, scrub, massage, facial treatment and more) – but for a Valentine’s Day couples treat, nothing beats the Bubble of Love. The treatment, designed to send you and your other half to cloud nine, includes the following: a champagne bath, champagne scrub and massage, with a small bottle of Veuve Clicquot provided for your enjoyment during the bath. Now, doesn’t that sound like seventh heaven bliss? 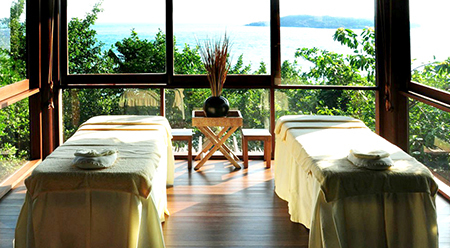 A massage treatment at Six Senses Samui Spa promises to be a feast for your senses. The spa menu doesn’t list any couple massage treatments – which leaves you free to design your own Valentine’s Day treat. Woohuu! If you’ll have our recommendations, we say: give the Harmonic Senses Therapy, Senses of Aroma or Swedish Aromatic Massage treatments a go. 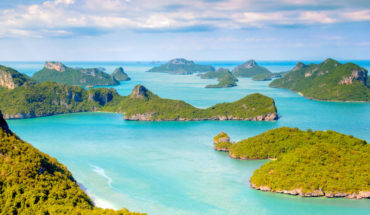 Sinking into a state of utter relaxation is a breeze when you’re enjoying a massage in a plush treatment room overlooking the boundless sea – which is what you’ll get at Conrad Spa Koh Samui. After you’ve snagged one of the couple treatment rooms, all that’s left is to take your pick from the plethora of indulgent treatments available. Will you go for the “Eden for Couples”, “Under Moonlight” or “Our Anniversary”? 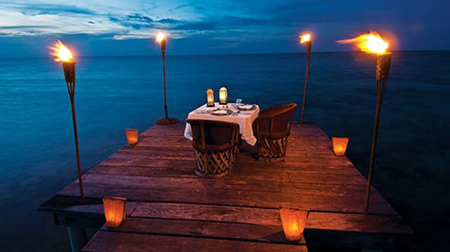 Very aptly named, the romantic dinner treat dished out by Four Seasons is truly “once in a blue moon“, for how often will you enjoy a decadent dinner along a secluded beachfront that can only be accessed by boat, or a mysterious “secret” staircase? If you’re intrigued by the notion of this exclusive experience, go for it. Otherwise, there’re other dining experiences that promise to tantalise and delight. How does having a luxurious affair sound? In love with Japanese fare? You can’t miss out on savouring the contemporary fare at Namu‘s. A Valentine’s Day menu has been drawn up, so look forward to tickling your tastebuds with mouthwatering dishes like the Seared Foie Gras, Smoked Eel and Lobster Croquet and Carpaccio Style of Tuna, before rounding off the night with a seductive Molten Chocolate. Ouh lala. The recipe for a perfect night includes the following: pre-dinner sundowners, al fresco dinner and post-dinner drinks. 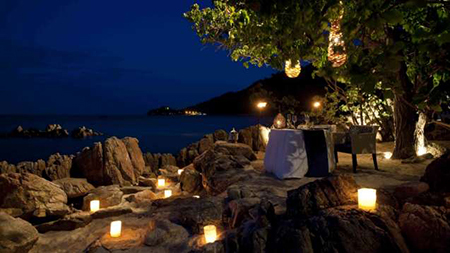 Banyan Tree Samui ticks the right boxes when it comes to being a date-worthy venue. Impress your date with a carefully crafted cocktail (or two) at the sleek Pool Bar. 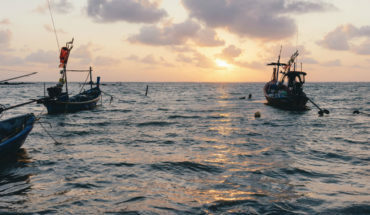 After catching the sunset, you’ll have to decide: will it be beachfront dining at Sands, authentic Thai at Saffron or savouring international delights at The Edge? 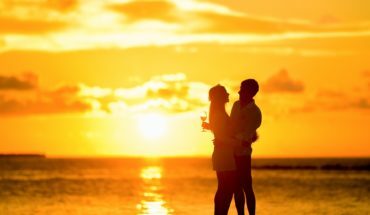 Panoramic views of the sea, refreshing sea breezes and a spectacular sunset – doesn’t this all sound perfect for a very special Valentine’s? Start your cruise in the late afternoon if you wish to soak up the sun; the pillowy sun beds on the deck provide a comfortable seat. With a cocktail in hand, you’re primed to enjoy the picture-perfect sunset. Round out the night with a sumptuous dinner – and don’t forget to plan a heartwarming flower-and-champagne surprise. Are you the lucky man who gets to call a certain very special lady your own (or vice versa)? 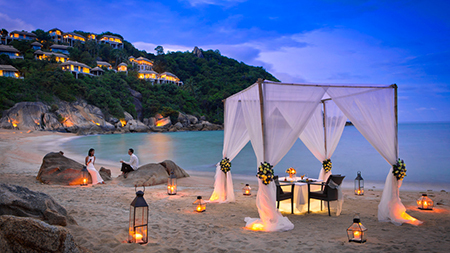 If you’ve nodded in affirmation, surprise your loved one with a romantic dinner for two at Anantara Samui. This experience, very aptly termed “Dining by Design“, offers a highly personalised dining experience. The event coordinator at Anantara will lend his or her magic hands to conjour up a magical dinner in the breezy sala, gorgeous beachfront or picturesque garden. Dining in a top-notch restaurant is an enviable affair, but for a dining experience that’s hard to beat, make plans for an irresistible al fresco dinner in the compounds of your private villa. Apart from having your very own chef and a team of amiable staff to dish out tasty plates for the night, there won’t be anyone else other than you and your significant other. What better way to kickstart an unforgettable night?